Kuala Lumpur (/ˈkwɑːlə ˈlʊmpʊər, -pər/; Malaysian: [ˈkwalə ˈlumpʊr]), officially the Federal Territory of Kuala Lumpur (Malay: Wilayah Persekutuan Kuala Lumpur) or commonly known as KL, is the national capital and largest city in Malaysia. As the global city of Malaysia, it covers an area of 243 km2 (94 sq mi) and has an estimated population of 1.73 million as of 2016[update]. Greater Kuala Lumpur, also known as the Klang Valley, is an urban agglomeration of 7.25 million people as of 2017[update]. It is among the fastest growing metropolitan regions in Southeast Asia, in both population and economic development. Kuala Lumpur is the cultural, financial and economic centre of Malaysia. It is also home to the Parliament of Malaysia and the official residence of the Malaysian King (Yang di-Pertuan Agong), the Istana Negara. The city once held the headquarters of the executive and judicial branches of the federal government, but these were relocated to Putrajaya in early 1999. However, some sections of the political bodies still remain in Kuala Lumpur. Kuala Lumpur is one of the three Federal Territories of Malaysia, enclaved within the state of Selangor, on the central west coast of Peninsular Malaysia. Since the 1990s, the city has played host to many international sporting, political and cultural events including the 1998 Commonwealth Games and the 2017 Southeast Asian Games. Kuala Lumpur has undergone rapid development in recent decades and is home to the tallest twin buildings in the world, the Petronas Towers, which have since become an iconic symbol of Malaysian development. Kuala Lumpur has a comprehensive road system supported by an extensive range of public transport networks, such as the Mass Rapid Transit (MRT), Light Metro (LRT), Bus Rapid Transit (BRT), monorail, commuter rail and an airport rail link. Kuala Lumpur is one of the leading cities in the world for tourism and shopping, being the tenth most-visited city in the world in 2017. The city houses three of the world's ten largest shopping malls. Kuala Lumpur has been ranked by the Economist Intelligence Unit's Global Liveability Ranking at No. 70 in the world, and No. 2 in Southeast Asia after Singapore. EIU's Safe Cities Index of 2017 rated Kuala Lumpur 31st out of 60 on its world's safest cities list, safer than Beijing or Shanghai. Kuala Lumpur was named as one of the New7Wonders Cities, and has been named as World Book Capital 2020 by UNESCO. Jamek Mosque at the confluence of Gombak (left) and Klang (right) rivers. The earliest settlement of Kuala Lumpur developed on the eastern side of the river bank (to the right in this picture). Kuala Lumpur means "muddy confluence" in Malay; kuala is the point where two rivers join together or an estuary, and lumpur means "mud". One suggestion is that it was named after Sungai Lumpur ("muddy river"); it was recorded in the 1820s that Sungei Lumpoor was the most important tin-producing settlement up the Klang River. Doubts however have been raised on such a derivation as Kuala Lumpur lies at the confluence of Gombak River and Klang River, therefore should rightly be named Kuala Gombak as the point where one river joins a larger one or the sea is its kuala. It has been argued by some that Sungai Lumpur is in fact Gombak River (therefore the point where it joined the Klang River would be Kuala Lumpur), although Sungai Lumpur is said to be another river joining the Klang River a mile upstream from the Gombak confluence, or perhaps located to the north of the Batu Caves area. It is unknown who founded or named the settlement called Kuala Lumpur. Chinese miners were involved in tin mining up the Selangor River in the 1840s about ten miles north of present-day Kuala Lumpur, and Mandailing Sumatrans led by Raja Asal and Sutan Puasa were also involved in tin mining and trade in the Ulu Klang region before 1860, and Sumatrans may have settled in the upper reaches of Klang River in the first quarter of the 19th century, possibly earlier. Kuala Lumpur was originally a small hamlet of just a few houses and shops at the confluence of Sungai Gombak and Sungai Klang (Klang River) before it grew into a town. It is generally accepted that Kuala Lumpur become established as a town circa 1857, when the Malay Chief of Klang, Raja Abdullah bin Raja Jaafar, aided by his brother Raja Juma'at of Lukut, raised funds from Malaccan Chinese businessmen to hire some Chinese miners from Lukut to open new tin mines here. The miners landed at Kuala Lumpur and continued their journey on foot to Ampang where the first mine was opened. Kuala Lumpur was the furthest point up the Klang River to which supplies could conveniently be brought by boat; it therefore became a collection and dispersal point serving the tin mines. Although the early miners suffered a high death toll due to the malarial conditions of the jungle, the Ampang mines were successful, and the first tin from these mines was exported in 1859. At that time Sutan Puasa was already trading near Ampang, two traders from Lukut, Hiu Siew and Yap Ah Sze, then arrived in Kuala Lumpur where they set up shops to sell provisions to miners in exchange for tin. The town, spurred on by tin-mining, started to develop centred on Old Market Square (Medan Pasar), with roads radiating out towards Ampang as well as Pudu and Batu where miners also started to settled in, and Petaling and Damansara. The miners formed gangs among themselves; and fights between different gangs were frequent in this period, particularly between factions of Kuala Lumpur and Kanching, mainly to gain control of the best tin mines. Leaders of the Chinese community were conferred the title of Kapitan Cina (Chinese headman) by the Malay chief, and Hiu Siew the early Chinese trader was chosen as the first Kapitan of Kuala Lumpur. The third Chinese Kapitan of Kuala Lumpur, Yap Ah Loy, was appointed in 1868. Important Malay figures of early Kuala lumpur also include Haji Mohamed Tahir who became the Dato Dagang ("chief of traders"). The Minangkabaus from Sumatra became another important group of peoples who traded and established tobacco plantations in the area. Notable Minangkabaus include their headman Dato' Sati, Utsman Abdullah, and Haji Mohamed Taib who was involved in the early development of Kampung Baru. The Minangkabaus are also important socio-religious figures, for example Utsman bin Abdullah was the first kadi of Kuala Lumpur as well as Muhammad Nur bin Ismail. Early Kuala Lumpur was a small town that suffered from many social and political problems – the buildings were made of wood and atap (palm frond thatching) that were prone to fire, lack of proper sanitation plagued the town with diseases, and it suffered from a constant threat of flooding. The town became embroiled in the Selangor Civil War due in part to the fight for control of revenues from the tin mines. The Chinese Kapitan Yap Ah Loy aligned himself with Tengku Kudin, and the rival Chinese gang allied themselves with Raja Mahdi. Raja Asal and Sutan Puasa also switched side to Raja Mahdi, and Kuala Lumpur was captured in 1872 and burnt to the ground. Yap escaped to Klang where he reassembled a fighting force. Kuala Lumpur was recaptured by Yap in March 1873 when Raja Mahdi forces were defeated with the help of fighters from Pahang. The war and other setbacks, such as a drop in tin prices, led to a slump, furthermore a major outbreak of cholera caused many to flee the town. The slump lasted until late 1879, when a rise in the price of tin allowed the town to recover. In late 1881, the town was severely flooded, following a fire that had destroyed the entire town in January that year. That the town was rebuilt a few times and thrived was due in large part to the tenacity and persistence of Yap Ah Loy. Yap, together with Frank Swettenham who was appointed the Resident in 1882, were the two most important figures of early Kuala Lumpur with Swettenham credited with its rapid growth and development and its transformation into a major urban centre. The early Chinese and Malay settlements were along the east bank of the Klang River – the Chinese mainly settled around the commercial centre of Market Square; the Malays, later Indian Chettiars and Indian Muslims resided in the Java Street (now Jalan Tun Perak) area. 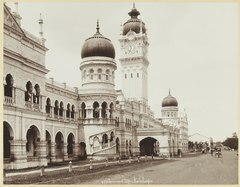 In 1880, the state capital of Selangor was moved from Klang to the more strategically advantageous Kuala Lumpur by the colonial administration, and the British Resident William Bloomfield Douglas then decided that the government buildings and living quarters should be located to the west of the river. Government offices and a new police headquarters was built on Bukit Aman, and the Padang was created initially for police training. The Padang, now known as Merdeka Square, would later become the centre of the British administrative offices when the colonial government offices were moved to the Sultan Abdul Samad Building in 1897. Frank Swettenham, on becoming the British Resident, began improving the town by cleaning up the streets. He also stipulated in 1884 that buildings should be constructed of brick and tile so that they would be less flammable, and that the town be rebuilt with wider streets to reduce fire risk. Kapitan Yap Ah Loy bought a sprawling piece of real estate to set up a brick industry for the rebuilding of Kuala Lumpur; this place is the eponymous Brickfields. Destroyed atap buildings were replaced with brick and tiled ones, and many of the new brick buildings are characterised by the "five-foot ways" as well as Chinese carpentry work. This resulted in a distinct eclectic shop house architecture typical to this region. Kapitan Yap Ah Loy expanded road access in the city significantly, linking up tin mines with the city; these roads include the main arterial routes of the present Ampang Road, Pudu Road and Petaling Street. As Chinese Kapitan, he was vested with wide powers on a par with Malay community leaders. Law reforms were implemented and new legal measures introduced to the assembly. Yap also presided over a small claims court. With a police force of six, he was able to uphold the rule of law, constructing a prison that could accommodate 60 prisoners at any time. Kapitan Yap Ah Loy also built Kuala Lumpur's first school and a major tapioca mill in Petaling Street of which the Selangor's Sultan Abdul Samad held an interest. The construction of the railway spurred the growth of the city. The first headquarters of the Federated Malay States Railways (now the National Textile Museum) in Kuala Lumpur shown, with the dome of the F.M.S. Government Offices just visible behind, c. 1910. 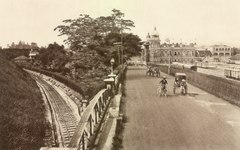 A railway line between Kuala Lumpur and Klang, initiated by Swettenham and completed in 1886, increased accessibility which resulted in the rapid growth of the town. The population grew from 4,500 in 1884 to 20,000 in 1890. As development intensified in the 1880s, it also put pressure on sanitation, waste disposal and other health issues. A Sanitary Board was created on 14 May 1890 which was responsible for sanitation, upkeep of roads, lighting of street and other functions. This would eventually become the Kuala Lumpur Municipal Council. In 1896, Kuala Lumpur was chosen as the capital of the newly formed Federated Malay States. The development of rubber industry in Selangor fueled by the demand for car tyre in the early 20th century led to a boom of the town, with the population of Kuala Lumpur increasing from 30,000 in 1900 to 80,000 in 1920. Previously the commercial activities of Kuala Lumpur were run to a large extent by Chinese businessmen such as Loke Yew who was then the richest and most influential Chinese of Kuala Lumpur. The growth of the rubber industry led to an influx of foreign capital and planters, with new companies and industries becoming established in Kuala Lumpur, and other companies previously based elsewhere also found a presence here. Japanese troops advancing up High Street (now Jalan Tun H S Lee) in Kuala Lumpur in December 1941 during World War II. During World War II, Kuala Lumpur was captured by the Imperial Japanese Army on 11 January 1942. Despite suffering little damage during the course of the battle, the wartime occupation of the city resulted in significant loss of lives; at least 5,000 Chinese were killed in Kuala Lumpur in just a few weeks of the occupation by Japanese forces, and thousands of Indians were sent as forced labour to work on the Burma Railway where a large number died. They occupied the city until 15 August 1945, when the commander in chief of the Japanese Seventh Area Army in Singapore and Malaysia, Seishirō Itagaki, surrendered to the British administration following the atomic bombings of Hiroshima and Nagasaki. Kuala Lumpur grew through the war, and continued after the war during the Malayan Emergency, during which Malaya was preoccupied with the communist insurgency and New Villages were established on the outskirts of the city in an attempt to control community contacts with the insurgents. The first municipal election in Kuala Lumpur was held on 16 February 1952. An ad hoc alliance between the Malay UMNO and Chinese MCA party candidates won a majority of the seats contested, and their success led to the formation of the Alliance Party (later the Barisan Nasional). On 31 August 1957, the Federation of Malaya gained its independence from British rule. The British flag was lowered and the Malayan flag was raised for the first time at the Padang on the midnight of 30 August 1957, and in the morning of 31 August, the ceremony for the Declaration of Independence was held at the Merdeka Stadium by the first Prime Minister of Malaya, Tunku Abdul Rahman. Kuala Lumpur remained the capital after the formation of Malaysia on 16 September 1963. The Malaysian Houses of Parliament was completed at the edge of the Lake Gardens in 1963. Kuala Lumpur had seen a number of civil disturbances over the years. A riot in 1897 was a relatively minor affair that began with the confiscation of faulty dacing (a scale used by traders), and in 1912, a more serious disturbance called the tauchang riot began during the Chinese New Year with the cutting of pigtails and ended with rioting and factional fighting lasting a number of days. The worst rioting on record in Malaysia however occurred on 13 May 1969, when race riots broke out in Kuala Lumpur. The so-called 13 May Incident refers to the violent conflicts that took place between members of the Malay and the Chinese communities. The violence was the result of Malaysian Malays being dissatisfied with their socio-political status. The riots caused the deaths of 196 people according to official figures, and led to major changes in the country's economic policy to promote and prioritise Malay economic development over that of the other ethnicities. Kuala Lumpur achieved city status on 1 February 1972, becoming the first settlement in Malaysia to be granted the status after independence. Later, on 1 February 1974, Kuala Lumpur became a Federal Territory. Kuala Lumpur ceased to be the capital of Selangor in 1978 after the city of Shah Alam was declared the new state capital. On 14 May 1990, Kuala Lumpur celebrated 100 years of local council. The new federal territory Kuala Lumpur flag and anthem were introduced. On 1 February 2001, Putrajaya was declared a Federal Territory, as well as the seat of the federal government. The administrative and judicial functions of the government were shifted from Kuala Lumpur to Putrajaya. Kuala Lumpur however still retained its legislative function, and remained the home of the Yang di-Pertuan Agong (Constitutional King). Kuala Lumpur City Centre (KLCC). From the 1990s onwards, major urban developments in the Klang Valley have resulted in an extended Kuala Lumpur Metropolitan Area. This area, known as Greater Kuala Lumpur, extends from the Federal Territory of Kuala Lumpur westward to Port Klang, east to the edge of the Titiwangsa Mountains as well as to the north and south. The area covers other administratively separate towns and cities such as Klang, Shah Alam, Putrajaya and others, and it is served by the Klang Valley Integrated Transit System. Notable projects undertaken within Kuala Lumpur itself include the development of a new Kuala Lumpur City Centre around Jalan Ampang and the Petronas Towers. The geography of Kuala Lumpur is characterised by the huge Klang Valley. The valley is bordered by the Titiwangsa Mountains in the east, several minor ranges in the north and the south and the Strait of Malacca in the west. Kuala Lumpur is a Malay term that translates to "muddy confluence" as it is located at the confluence of the Klang and Gombak rivers. Located in the centre of Selangor state, Kuala Lumpur was a territory of Selangor State Government. In 1974, Kuala Lumpur was separated from Selangor to form the first Federal Territory governed directly by the Malaysian Federal Government. Its location within the most developed state on the west coast of Peninsular Malaysia, which has wider flat land than the east coast, has contributed to its faster development relative to other cities in Malaysia. The municipality of the city covers an area of 243 km2 (94 sq mi), with an average elevation of 81.95 m (268.9 ft). Protected by the Titiwangsa Range in the east and Indonesia's Sumatra Island in the west, Kuala Lumpur is safe from strong winds and has a tropical rainforest climate (Köppen climate classification Af), which is warm and sunny, along with abundant rainfall, especially during the northeast monsoon season from October to March. Temperatures tend to remain constant. Maximums hover between 32 and 35 °C (90 and 95 °F) and sometime hit 40 °C (104.0 °F), while minimums hover between 23.4 and 24.6 °C (74.1 and 76.3 °F) and have never fallen below 14.4 °C (57.9 °F). Kuala Lumpur typically receives minimum 2,600 mm (100 in) of rain annually; June and July are relatively dry, but even then rainfall typically exceeds 131 millimetres (5.2 in) per month. Kuala Lumpur was administered by a corporation sole called the Federal Capital Commissioner from 1 April 1961, until it was awarded city status in 1972, after which executive power transferred to the Lord Mayor (Datuk Bandar). Nine mayors have been appointed since then. The current mayor is Mhd Amin Nordin Abdul Aziz, who has been in office since 18 July 2015. The local administration is carried out by the Kuala Lumpur City Hall, an agency under the Federal Territories Ministry of Malaysia. It is responsible for public health and sanitation, waste removal and management, town planning, environmental protection and building control, social and economic development, and general maintenance functions of urban infrastructure. Executive power lies with the mayor in the city hall, who is appointed for three years by the Federal Territories Minister. This system of appointing the mayor has been in place ever since the local government elections were suspended in 1970. Kuala Lumpur's eleven districts serve as administrative subdivisions under the Kuala Lumpur City Hall authority. Kuala Lumpur is home to the Parliament of Malaysia. The hierarchy of authority in Malaysia, in accordance with the Federal Constitution, has stipulated the three branches, of the Malaysian government as consisting of the Executive, Judiciary and Legislative branches. The Parliament consists of the Dewan Negara (Upper House / House of Senate) and Dewan Rakyat (Lower House / House of Representatives). A pedestrian mall by the Central Market. Kuala Lumpur and its surrounding urban areas form the most industrialised and economically, the fastest growing region in Malaysia. Despite the relocation of federal government administration to Putrajaya, certain government institutions such as Bank Negara Malaysia (National Bank of Malaysia), Companies Commission of Malaysia and Securities Commission as well as most embassies and diplomatic missions have remained in the city. The city remains as the economic and business hub in the country. Kuala Lumpur is a centre for finance, insurance, real estate, media and the arts of Malaysia. Kuala Lumpur is rated as an alpha world city, and is the only global city in Malaysia, according to the Globalization and World Cities Study Group and Network (GaWC). The infrastructure development in the surrounding areas such as the Kuala Lumpur International Airport at Sepang, the creation of the Multimedia Super Corridor and the expansion of Port Klang further reinforce the economic significance of the city. Bursa Malaysia or the Malaysia Exchange is based in the city and forms one of its core economic activities. As of 5 July 2013[update], the market capitalisation stood at US$505.67 billion. The large service sector is evident in the number of local and foreign banks and insurance companies operating in the city. Kuala Lumpur is poised to become the global Islamic Financing hub with an increasing number of financial institutions providing Islamic Financing and the strong presence of Gulf's financial institutions such as the world's largest Islamic bank, Al-Rajhi Bank and Kuwait Finance House. Apart from that, the Dow Jones & Company is keen to work with Bursa Malaysia to set up Islamic Exchange Trade Funds (ETFs), which would help raise Malaysia's profile in the Gulf. The city has a large number of foreign corporations and is also host to many multi national companies' regional offices or support centres, particularly for finance and accounting, and information technology functions. Most of the country's largest companies have their headquarters here, and as of December 2007 and excluding Petronas, there are 14 companies that are listed in Forbes 2000 based in Kuala Lumpur. There has been growing emphasis to expand the economic scope of the city into other service activities, such as research and development, which supports the rest of the economy of Malaysia. Kuala Lumpur has been home for years to important research centres such as the Rubber Research Institute of Malaysia, the Forest Research Institute Malaysia and the Institute of Medical Research and more research centres are expected to be established in the coming years. Tourism plays an important role in the city's service-driven economy. Many large worldwide hotel chains have a presence in the city. One of the oldest hotels is the Hotel Majestic. Kuala Lumpur is the sixth most visited city in the world, with 8.9 million tourists per year. Tourism here is driven by the city's cultural diversity, relatively low costs, and wide gastronomic and shopping variety. MICE tourism, which mainly encompasses conventions— has expanded in recent years to become a vital component of the industry, and is expected to grow further once the Malaysian government's Economic Transformation Programme kicks in, and with the completion of a new 93,000m2-size MATRADE Centre in 2014. Another notable trend is the increased presence of budget hotels in the city. The major tourist destinations in Kuala Lumpur include the PETRONAS Twin Tower, the Bukit Bintang shopping district, the Kuala Lumpur Tower, Petaling Street (Chinatown), the Merdeka Square, the House of Parliament, the National Palace (Istana Negara), the National Museum, Islamic Arts Museum, Central Market, KL Bird Park, Aquaria KLCC, the National Monument, and religious sites such as the Sultan Abdul Samad Jamek Mosque. Kuala Lumpur plays host to many cultural festivals such as the Thaipusam procession at the Sri Mahamariamman Temple. Every year during the Thaipusam celebration, a silver chariot carrying the statue of Lord Muruga together with his consort Valli and Teivayanni would be paraded through the city beginning at the temple all the way to Batu Caves in the neighboring Selangor. The entertainment hub of the city is mainly centred in the Golden Triangle encompassing Jalan P. Ramlee, Jalan Sultan Ismail and Ampang Road. Trendy nightclubs, bars and lounges, such as Marini's on 57, Skybar at Traders Hotel, the Beach Club, Espanda, the Hakka Republic Wine Bar & Restaurant, Hard Rock Cafe, the Luna Bar, Nuovo, Rum Jungle, No Black Tie, the Thai Club, Zion club, Zouk, and many others are located here. Suria KLCC is one of Malaysia's premier upscale shopping destination due to its location beneath the Petronas Twin Towers. Apart from Suria KLCC, Bukit Bintang district has the highest concentration of shopping malls in Kuala Lumpur. It includes: Pavilion, Fahrenheit 88, Plaza Low Yat, Berjaya Times Square, Lot 10, BB Plaza, Sungei Wang Plaza and Quill City Mall. Changkat area of Bukit Bintang hosts various cafes, alfresco dining outlets and illegal activities. Bangsar district also has a few shopping complexes, including Bangsar Village, Bangsar Shopping Centre, and Mid Valley Megamall. Apart from shopping complexes, Kuala Lumpur has designated numerous zones in the city to market locally manufactured products such as textiles, fabrics and handicrafts. The Chinatown of Kuala Lumpur, commonly known as Petaling Street, is one of them. Chinatown features many pre-independence buildings with Straits Chinese and colonial architectural influences. Kuala Lumpur is the most populous city in Malaysia, with a population of 1.76 million in the city proper as of 2016[update]. It has a population density of 6,696 inhabitants per square kilometre (17,340/sq mi), and is the most densely populated administrative district in Malaysia. Residents of the city are colloquially known as KLites. Kuala Lumpur is also the centre of the wider Klang Valley metropolitan (covering Petaling Jaya, Klang, Subang Jaya, Puchong, Shah Alam, Gombak and others) which has an estimated metropolitan population of 7.25 million as of 2017[update]. Historically Kuala Lumpur was a predominantly Chinese city, although more recently the Bumiputra component of the city has increased substantially and they are now the dominant group. The Kuala Lumpur of 1872 beside the Klang River was described by Frank Swettenham as a "purely Chinese village", although a Malay stockade already existed at Bukit Nanas at that time. By 1875, after the Selangor Civil War had ended, Swettenham noted Malay quarters near the Chinese area in a sketch map he had drawn, and there were said to be 1,000 Chinese and 700 Malays in the town in this period (many of the Malays may have settled in Kuala Lumpur after the war). The population of Kuala Lumpur had increased to around three thousand in 1880 when it was made the capital of Selangor. The most significant component of the Malay population in Kuala Lumpur of this period were those recruited by the British in 1880 mostly from rural Malacca to establish a police force of 2–300, and many of them then brought their families here. Many of the Malays were originally from the other islands of Malay Archipelago – Sumatrans such as the Mandailings, the Minangkabaus, Javanese, and Buginese began arriving in Kuala Lumpur in the 19th century, while the Acehnese arrived in the late 20th century. In the following decade which saw the rebuilding of the town it showed considerable increase with a large influx of immigrants, due in large part to the construction of a railway line in 1886 connecting Kuala Lumpur and Klang. A census in 1891 of uncertain accuracy gave a figure of 43,796 inhabitants, 79% of whom were Chinese (71% of the Chinese were Hakka), 14% Malay, and 6% Indian. Another estimate put the population of Kuala Lumpur in 1890 at 20,000. In 1931, 61% of Kuala Lumpur's 111,418 inhabitants were Chinese, and in 1947 63.5%. The Malays however began to settle in the Kuala Lumpur in significant numbers, in part due to government employment, as well as the expansion of the city that absorbed the surrounding rural areas where many Malays lived. Between 1947 and 1957 the population of Malays in Kuala Lumpur doubled, increasing from 12.5 to 15%, while the proportion of Chinese dropped. The process continued after Malayan independence with the growth of a largely Malay civil service, and later the implementation of the New Economic Policy which encouraged Malay participation in urban industries and business. In 1980 the population of Kuala Lumpur had reached over a million, with 52% Chinese, 33% Malay, and 15% Indian. From 1980 to 2000 the number of Bumiputras increased by 77%, but the Chinese still outnumbered the Bumiputras in Kuala Lumpur in the 2000 census at 43% compared to Bumiputras at 38%. By the 2010 census, according to the Department of Statistics and excluding non-citizens, the percentage of the Bumiputera population in Kuala Lumpur had reached around 45.9% (44.7% Malay), with the Chinese population at 43.2% and Indians 10.3%. A notable phenomenon in recent times has been the increase of foreign residents in Kuala Lumpur, which rose from 1% of the city's population in 1980 to about 8% in the 2000 census, and 9.4% in the 2010 census. These figures also do not include a significant number of illegal immigrants. Kuala Lumpur's rapid development has triggered a huge influx of low-skilled foreign workers from Indonesia, Nepal, Myanmar, Thailand, Bangladesh, India, Pakistan, Sri Lanka, Philippines, and Vietnam into Malaysia, many of whom enter the country illegally or without proper permits. As of 2010[update] Census the population of Kuala Lumpur was 46.4% Muslim, 35.7% Buddhist, 8.5% Hindu, 5.8% Christian, 1.4% of unknown affiliations, 1.1% Taoist or Chinese religion adherent, 0.6% follower of other religions, and 0.5% non-religious. Bahasa Malaysia is the principal language in Kuala Lumpur. Kuala Lumpur residents are generally literate in English, with a large proportion adopting it as their first language. Malaysian English is a variant widely used. It has a strong presence, especially in business and is a compulsory language taught in schools. Cantonese and Mandarin are prominent as they are spoken by the local majority Chinese population. Another major dialect spoken is Hakka. While Tamil is dominant amongst the local Indian population, other Indian languages spoken by minorities include Telugu, Malayalam, Punjabi, and Hindi. Beside the Malay language, there are a variety of languages spoken by people of Indonesian descent, such as Minangkabau and Javanese. The architecture of Kuala Lumpur is a mixture of old colonial influences, Asian traditions, Malay Islamic inspirations, modern, and postmodern architecture mix. Being a relatively young city compared with other Southeast Asian capitals such as Bangkok, Jakarta and Manila, most of Kuala Lumpur's notable colonial-era buildings were built toward the end of the 19th and early 20th centuries. These buildings were designed in a number of styles – Mughal/Moorish Revival, Mock Tudor, Neo-Gothic or Grecian-Spanish style or architecture. Most of the styling has been modified to use local resources and acclimatised to the local climate, which is hot and humid all year around. A significant architect of the early period is Arthur Benison Hubback who designed a number of the colonial era buildings including the Kuala Lumpur Railway Station and Jamek Mosque. Prior to the Second World War, many shophouses, usually two stories with functional shops on the ground floor and separate residential spaces upstairs, were built around the old city centre. These shop-houses drew inspiration from Straits Chinese and European traditions. Some of these shophouses have made way for new developments but there are still many standing today around Medan Pasar (Old Market Square), Chinatown, Jalan Tuanku Abdul Rahman, Jalan Doraisamy, Bukit Bintang and Tengkat Tong Shin areas. Independence coupled with the rapid economic growth from the 1970s to the 1990s and with Islam being the official religion in the country, has resulted in the construction of buildings with a more local and Islamic flavour arise around the city. Many of these buildings derive their design from traditional Malay items such as the songkok and the keris. Some of these buildings have Islamic geometric motifs integrated with the designs of the building, signifying Islamic restriction on imitating nature through drawings. Examples of these buildings are Telekom Tower, Maybank Tower, Dayabumi Complex, and the Islamic Centre. Some buildings such as the Islamic Arts Museum Malaysia and National Planetarium have been built to masquerade as a place of worship, complete with dome and minaret, when in fact it is a place of science and knowledge. The 452-metre (1,483 ft) tall Petronas Towers are the tallest twin buildings in the world. They were designed to resemble motifs found in Islamic art. Late modern and postmodern architecture began to appear in the late-1990s and early-2000s. With the economic development, old buildings such as Bok House have been razed to make way for new ones. Buildings with all-glass shells exist throughout the city, with the most prominent examples being the Petronas Towers and Kuala Lumpur Convention Centre. Kuala Lumpur's central business district today has shifted around the Kuala Lumpur city centre (KLCC) where many new and tall buildings with modern and postmodern architecture fill the skyline. According to the World Tallest 50 Urban Agglomeration 2010 Projection by the Council on Tall Buildings and Urban Habitat, Kuala Lumpur was ranked 10th among cities to have most buildings above 100 metres with a combined height of 34,035 metres from its 244 high rise buildings. The Lake Gardens, a 92-hectare (230-acre) botanical garden, is the first recreational park created in Kuala Lumpur. The Malaysian Parliament building is located close by, and Carcosa Seri Negara which was once the official residence of British colonial administration is also sited here. The park includes a Butterfly Park, Deer Park, Orchid Garden, Hibiscus Garden and the Kuala Lumpur Bird Park, which is the world's largest aviary bird park. Other parks in the city include the ASEAN Sculpture Garden, KLCC Park, Titiwangsa Lake Gardens, Metropolitan Lake Gardens in Kepong, Forest Research Institute of Malaysia, Taman Tasik Permaisuri (Queen's Lake Gardens), Bukit Kiara Botanical Gardens, Equestrian Park and West Valley Park near TTDI, and Bukit Jalil International Park. There are three forest reserves within the city namely the Bukit Nanas Forest Reserve in the city centre, the oldest gazetted forest reserve in the country 10.52 ha or 26.0 acres, Bukit Sungai Putih Forest Reserve (7.41 ha or 18.3 acres) and Bukit Sungai Besi Forest Reserve (42.11 ha or 104.1 acres). Bukit Nanas, in the heart of the city centre, is one of the oldest virgin forests in the world within a city. These residual forest areas are home to a number of fauna species particularly monkeys, treeshrews, pygmy goats, budgerigars, squirrels and birds. There is another park in the close vicinity to Kuala Lumpur i.e. Templer Park initiated and opened by Sir Gerald Templer in 1954 during the "Emergency" time. Several institutions in the city are older than 100 years—such as Bukit Bintang Girls' School (1893–2000, relocated to Taman Shamelin Perkasa in Cheras and renamed GIS Garden International school Seri Bintang Utara), the Victoria Institution (1893); Methodist Girls' School (1896); Methodist Boys' School (1897); Convent Bukit Nanas (1899), St. John's Institution (1904), Confucian Private Secondary School(1906), Kuen Cheng High School (1908) and Tsun Jin High School (1913). Kuala Lumpur is home to the University of Malaya (UM). Established in 1949, it is the oldest university in Malaysia, and one of the oldest in the region. It was ranked the best university in Malaysia, the 22nd best in Asia, and 3rd in Southeast Asia in QS World University Rankings 2019. In recent years, the number of international students at University of Malaya has risen, as a result of increasing efforts made to attract more international students. Other universities located in Kuala Lumpur include Universiti Tunku Abdul Rahman (UTAR), International Islamic University Malaysia (IIUM), Tunku Abdul Rahman University College (TARUC), UCSI University (UCSI), Taylor's University (TULC), International Medical University (IMU), Open University Malaysia (OUM), Kuala Lumpur University (UniKL), Wawasan Open University (WOU), HELP University and the branch campus of the National University of Malaysia (UKM) and University of Technology Malaysia (UTM). The National Defence University of Malaysia is located at Sungai Besi Army Base, at the southern part of central Kuala Lumpur. It was established to be a major centre for military and defence technology studies. This institution covers studies in the field of army, navy, and air force. Greater Kuala Lumpur covers an even more extensive selection of universities including several international branches such as Monash University Malaysia Campus, University of Nottingham Malaysia Campus and Xiamen University Malaysia. Kuala Lumpur is a hub for cultural activities and events in Malaysia. Among the centres is the National Museum, which is situated along the Mahameru Highway. Its collection comprises artefacts and paintings collected throughout the country. The Islamic Arts Museum, which houses more than seven thousand Islamic artefacts including rare exhibits as well as a library of Islamic art books, is the largest Islamic Arts collection in Southeast Asia. The museum's collection not only concentrate on works from the Middle East, but also includes work from elsewhere in Asia, such as China and Southeast Asia. Kuala Lumpur has a Craft Complex coupled with a museum that displays a variety of textile, ceramic, metal craft and weaved products. All the information of the production process are portrayed in diorama format complete with historical facts, technique and traditionally engineered equipment. Among the processes shown are pottery making, intricate wood carving, silver-smithing, weaving songket cloth, stamping batik patterns on cloth and boat making. Royal Selangor has an ultra modern visitor's centre, which allows tours to be conducted through its pewter museum, gallery and its factory. In its pewtersmithing workshop, "The School of Hard Knocks", participants are taught to create their own pewter dish using traditional tools and methods. The premier performing arts venue is the Petronas Philharmonic Hall located underneath the Petronas Towers. The resident orchestra is the Malaysian Philharmonic Orchestra (MPO), consisting of musicians from all over the world and features regular concerts, chamber concerts and traditional cultural performances. The Kuala Lumpur Performing Arts Centre (KLPac) in Sentul West and Damansara Performing Arts Centre (DPac) in Damansara Perdana are two of the most established centres for performing arts, notably theatre, plays, music, and film screening in the country. It has housed many local productions and has been a supporter of local and regional independent performance artists. The Future Music Festival Asia are being held in the city since 2012 featuring local and international artists. The National Art Gallery of Malaysia is located on Jalan Temerloh, off Jalan Tun Razak on a 5.67-hectare (14.0-acre) site neighbouring the National Theatre (Istana Budaya) and National Library. The architecture of the gallery incorporates elements of traditional Malay architecture, as well as contemporary modern architecture. The National Art Gallery serves as a centre of excellence and trustee of the national art heritage. The Petronas Art Gallery, another centre for fine art, is situated in Kuala Lumpur City Centre (KLCC). The Ilham Tower Gallery near Ampang Park houses exhibitions of works by local and foreign artists. Kuala Lumpur holds the Malaysia International Gourmet Festival annually. Another event hosted annually by the city is the Kuala Lumpur Fashion Week, which includes international brands as well as local designers. Kuala Lumpur was touted as one of the host cities for the Formula One World Championship from 1999 to 2017. The open-wheel auto racing A1 Grand Prix was held until the series folded in 2009. The Motorcycle Grand Prix races are held at the Sepang International Circuit in Sepang in the neighbouring state of Selangor. The Formula One event contributed significantly to tourist arrivals and tourism income to Kuala Lumpur. This was evident during the Asian financial crisis in 1998. Despite cities around Asia suffering declining tourist arrivals, Kuala Lumpur tourist arrivals increased from 6,210,900 in 1997 to 10,221,600 in 2000, or 64.6% increase in tourist arrivals. In 2015, the Kuala Lumpur Street Circuit was constructed to host the Kuala Lumpur City Grand Prix motor racing event. Football is one of the most popular sports in Kuala Lumpur. The Merdeka Tournament is mainly held at Stadium Merdeka. The city also the home of Kuala Lumpur FA, which plays in the Malaysia Super League. Kuala Lumpur hosted the official Asian Basketball Championship in 1965, 1977 and 1985. The city's basketball supporters cheered Malaysia's national basketball team to a Final Four finish in 1985, the team's best performance to date. Further, the city is home to the Westports Malaysia Dragons, 2016 Champion of the ASEAN Basketball League. The team plays its home games in the MABA Stadium. Other annual sport events hosted by the city include the KL Tower Run, the KL Tower International BASE Jump Merdeka Circuit and the Kuala Lumpur International Marathon. Kuala Lumpur is also one of the stages of the Tour de Langkawi cycling race. The annual Malaysia Open Super Series badminton tournament is held in Kuala Lumpur. Kuala Lumpur has a considerable array of sports facilities of international class after hosting the 1998 Commonwealth Games. Many of these facilities including the main stadium (with running track and a football field), hockey stadium and swimming pools are located in the National Sports Complex at Bukit Jalil while a velodrome and more swimming pools are located in Bandar Tun Razak, next to the Taman Tasik Permaisuri Lake Gardens. There are also football fields, local sports complexes, swimming pools and tennis courts scattered around the suburbs. Badminton and 'takraw' courts are usually included in community halls. The AFC House—current headquarters of the Asian Football Confederation—is built on a 4-acre (1.6 ha) complex in the Kuala Lumpur suburb of Bukit Jalil. Kuala Lumpur has several golf courses including the Kuala Lumpur Golf and Country Club (KLGCC) and the Malaysia Civil Service Golf Club in Kiara and the Berjaya Golf Course at Bukit Jalil. The city also has numerous large private fitness centres run by Celebrity Fitness, Fitness First, True Fitness and major five-star hotels. Kuala Lumpur is also the birthplace of Hashing, which began in December 1938 when a group of British colonial officers and expatriates, some from the Selangor Club, began meeting on Monday evenings to run, in a fashion patterned after the traditional British Paper Chase or "Hare and Hounds". Kuala Lumpur hosted the 128th IOC Session in 2015 where the IOC elected Beijing as the host city of the 2022 Winter Olympics and Lausanne as the host city of the 2020 Winter Youth Olympics. The Kuala Lumpur Tower is an important broadcast centre in the country. Several newspapers, including daily, opposition, business, and digital papers, are based in Kuala Lumpur. Daily newspapers include The Star, New Straits Times, The Sun, Malay Mail, Kosmo!, Utusan Malaysia, Berita Harian, and Harian Metro. Mandarin and Tamil newspapers are also published daily, for example Guang Ming Daily, Sin Chew Daily, China Press, Nanyang Siang Pau and Tamil Nesan, Malaysia Nanban, and Makkal Osai. Opposition newspapers such as Harakah, Suara Keadilan, Siasah and Wasilah are also based here. Kuala Lumpur is also the headquarters for Malaysia's state media public government terrestrial television stations: TV1 and TV2, the subsidiaries of RTM, TV Alhijrah, a subsidiary of Alhijrah Media Corporation, and Media Prima Berhad, a media corporation that houses the private commercial terrestrial television stations: TV3, NTV7, 8TV and TV9. Programmes are broadcast in Malay, English, Chinese and Tamil. TM Tower is the headquarters of Malaysia's principal telecommunication service provider, Telekom Malaysia. The city is home to the country's main pay television service, Astro, a satellite television service which broadcasts international television channels such as Fox Life and Fox Movies. Kuala Lumpur female diva pop vocal singer including Elizabeth Tan, Ernie Zakri and De Fam. Kuala Lumpur has been featured in all aspects of popular culture such as movies, television, music and books. Television series set in Kuala Lumpur include A Tale of 2 Cities (starring Rui En and Joanne Peh). Movies set in Kuala Lumpur include Police Story 3: Super Cop (starring Jackie Chan and Michelle Yeoh) and Entrapment (starring Sean Connery and Catherine Zeta-Jones), in which the Petronas Towers were depicted in flames for a few seconds. Kuala Lumpur was referenced in an episode of The Simpsons entitled "Bart Gets Famous", in which the Bumblebee Man stated that "a powerful tidal wave in Kuala Lumpur has killed 120 people". Books set in Kuala Lumpur include KL 24/7 by Ida M Rahim, Shireen Zainudin and Rizal Zainudin, My Life As a Fake by Peter Carey, and Democracy by Joan Didion. Kuala Lumpur is mentioned in many songs by local Malaysian artists, such as "Keroncong Kuala Lumpur'" by P. Ramlee, "Kuala Lumpur, Ibu Kota" by Saloma, "Chow Kit Road" by Sudirman Arshad, "Senyumlah Kuala Lumpur" by Alleycats, "Streets of Kuala Lumpur" by Murkyway, "K.L." by Vandal, "Kuala Lumpur" by Poetic Ammo, "Anak Dara" by Azmyl Yunor, "KL"' by Too Phat, "Kotarayaku" by Hujan and Altimet, and "Lagu Untuk Kuala Lumpur" by Tom. Kuala Lumpur, along with Sepang, was featured in the music video for the single "Gerimis Mengundang" by Elizabeth Tan. Kuala Lumpur was one of the destinations in The Amazing Race Asia and The Amazing Race. Games have also been set in Kuala Lumpur, including include three levels of the game Hitman 2: Silent Assassin and two levels of the PlayStation 2 game Burnout Dominator. A reality game show set in Kuala Lumpur from February until April 2013 was aired on AXN Asia. The Apprentice Asia was launched on 22 May 2013. Like most other Asian cities, driving is the main mode of commuting in Kuala Lumpur. Hence, every part of the city is well connected by highways. As capital of Malaysia, Kuala Lumpur has a comprehensive road network with more transportation development are being planned and carried out. In terms of air connectivity, Kuala Lumpur is served by two airports. The main airport, Kuala Lumpur International Airport (KLIA) at Sepang, Selangor, which is also the aviation hub of Malaysia, is located about 50 kilometres (31 mi) south of city. The other airport is Sultan Abdul Aziz Shah Airport, also known as Subang Skypark and served as the main international gateway to Kuala Lumpur from 1965 until KLIA opened in 1998. KLIA connects the city with direct flights to destinations in six continents around the world, and is the main hub for the national carrier, Malaysia Airlines and low-cost carrier, AirAsia. KLIA can be reached using the KLIA Ekspres a airport rail link service from KL Sentral, which takes twenty-eight minutes and costs 55 Malaysian Ringgit (roughly 13.50 US Dollar), while travelling by car or bus via highway will take about an hour but cost a lot less. Direct buses from KLIA to the city centre are plentiful (every 10 to 15 minutes during peak hours), air-conditioned and comfortable with fares ranging from 11 Malaysian Ringgit (roughly 2.70 US Dollar) to 15 Malaysian Ringgit (roughly 3.70 US Dollar). Air Asia and other low-cost carrier flights do not fly out of KLIA main terminal but from KLIA2 which is two kilometres from KLIA. KLIA2 is served by an extension of the KLIA Ekspres and by a free shuttle bus service from KLIA. As of 2018[update], Sultan Abdul Aziz Shah Airport is only used for chartered and turboprop flights by airlines such as Firefly and Malindo Air. Public transport in Kuala Lumpur and the rest of the Klang Valley covers a variety of transport modes such as bus, rail and taxi. Despite efforts to promote usage of public transport, utilisation rates are low as only 16 percent of the population used public transport in 2006. However, public transport utilisation is set to rise with the opening of 2 light metro (LRT) extension lines on 30 June 2016. Rail transport in Kuala Lumpur encompasses the light metro (LRT), monorail, commuter rail and Airport rail link. The LRT system has 2 lines namely, Kelana Jaya Line and Ampang Line, connecting many locations in the city with major suburbs in Greater Kuala Lumpur. The Monorail serves various key locations in the city centre whereas the KTM Komuter runs between the city and the suburbs. The main rapid transit hub is KL Sentral, which is an interchange station for the rail systems. KL Sentral is also a hub for intercity railway service namely KTM Intercity and KTM ETS. It provides rail services to as far as Singapore in the south, and Hat Yai, Thailand, in the north. The rail system in Kuala Lumpur is expanding fast with more train lines due for completion or in the pipeline. In December 2016, the 1st phase of Klang Valley Mass Rapid Transit (MRT) Project, Sungai Buloh-Kajang Line was completed, the remaining phases of the line has been open in July 2017. The largest public transport operator in Kuala Lumpur and the Klang Valley is Prasarana Malaysia via its subsidiaries of Rapid Rail and Rapid Bus using Rapid KL brands service. Since the take over from Intrakota Komposit Sdn Bhd, Prasarana Malaysia has redrawn the entire bus network of Kuala Lumpur and Klang Valley metropolitan area to increase passenger numbers and improve Kuala Lumpur's public transport system. The Prasarana Malaysia has adopted the hub and spoke system to provide greater connectivity, and cut down the need of more buses. In Kuala Lumpur, most taxis have distinctive white and red liveries. Kuala Lumpur is one of the major ASEAN city with taxis extensively running on natural gas. Taxis can be hailed from taxi stands or from the streets. Nevertheless, as been claimed by London-based website, LondonCabs.co.uk, taxis services in the city are charging high rates to passengers by refusing to turn on their meter and offer instead a flat rate fare that is overpriced, although other passengers refuted such claims. Kuala Lumpur is served by Port Klang, located about 64 km (40 mi) southwest of the city. The port is the largest and busiest in the country handling about 6.3 million twenty-foot equivalent units (TEU) of cargo in 2006. ^ "Malaya Celebrates, 1959". British Pathé. Retrieved 2 August 2013. ^ a b c "Laporan Kiraan Permulaan 2010". Jabatan Perangkaan Malaysia. p. 27. Archived from the original on 8 July 2011. Retrieved 24 January 2011. ^ "KL on track to megacity status". Focus Malaysia. Retrieved 30 April 2015. ^ "Malaysia Elevation Map (Elevation of Kuala Lumpur)". Flood Map : Water Level Elevation Map. Archived from the original on 22 August 2015. Retrieved 22 August 2015. ^ "Federal Territory of Kuala Lumpur". Department of Statistics, Malaysia. ^ "Federal Territory of Kuala Lumpur". Department of Statistics, Malaysia. Archived from the original on 23 June 2016. ^ a b "Kuala Lumpur Population 2017". World Population Review. ^ "Putrajaya – Administrative Capital of Malaysia". Government of Malaysia. Archived from the original on 21 October 2007. Retrieved 11 December 2007. ^ Gwillim Law (30 June 2015). "Malaysia States". Statoids. Retrieved 11 December 2007. ^ "Mastercard Destination Cities Index 2017" (PDF). MasterCard. 26 September 2017. Retrieved 3 June 2018. ^ Violet Kim (19 February 2014). "12 best shopping cities in the world". CNN Travel. Retrieved 13 August 2017. ^ "KL is second most liveable city in Southeast Asia". The Sun. 17 August 2017. Retrieved 27 August 2017. ^ "KL safer than Beijing, Shanghai but Tokyo tops list of safest cities". The Malay Mail. 16 October 2017. Retrieved 8 November 2017. ^ Linawati Adnan (9 December 2014). "Kuala Lumpur hailed as 'seven wonders cities' in the world". Astro Awani. Retrieved 27 August 2017. ^ "Kuala Lumpur named World Book Capital 2020". UNESCO. 30 September 2018. Retrieved 30 September 2018. ^ "Unesco names Kuala Lumpur World Book Capital". The Strait Times. 30 September 2018. Retrieved 30 September 2018. ^ "kuala in English". Glosbe. ^ Simon Richmond (25 November 2006). Malaysia, Singapore & Brunei. Ediz. Inglese. Lonely Planet Publications; 10th Revised edition. p. 85. ISBN 978-1-74059-708-1. ^ Gullick 2000, pp. 1–2. ^ a b c Gullick 1955, p. 11. ^ Gullick 1955, pp. 10–11. ^ a b c d J.M. Gullick (June 1990). "The Growth of Kuala Lumpur and the Malay Communities in Selangor Before 1880" (PDF). Journal of the Malaysian Branch of the Royal Asiatic Society. LXIII (1): 15–17. Archived from the original (PDF) on 15 August 2016. ^ a b Lam Seng Fatt (15 March 2011). Insider's Kuala Lumpur (3rd Edn): Is No Ordinary Travel Guide. Open Your Eyes to the Soul of the City (Not Just the Twin Towers...). Marshall Cavendish International Asia Pte Ltd. pp. 18–. ISBN 978-981-4435-39-0. ^ a b c d e f Keat Gin Ooi, ed. (2004). Southeast Asia: A Historical Encyclopedia, from Angkor Wat to East Timor, Volume 1. ABC-CLIO. ISBN 978-1-57607-770-2. ^ "Kuala Lumpur History". All Malaysia. Archived from the original on 18 October 2009. Retrieved 15 September 2009. ^ a b Gullick 1955, p. 10. ^ Willard Anderson Hanna (1959). Kuala Lumpur: An Amalgam of Tin, Rubber, and Races : a Brief Review of the City's Historical, Physical, and Psychological Development : a Report. American Universities Field Staff. ^ Kuala Lumpur: 100 Years. Kuala Lumpur Municipal Council. 1959. ^ Gullick 2000, pp. 7–9. ^ "From tin town to tower city". kiat.net. Archived from the original on 27 July 2010. Retrieved 28 September 2010. ^ a b J.M. Gullick (1955). "Kuala Lumpur 1880–1895" (PDF). Journal of the Malayan Branch of the Royal Asiatic Society. 24 (4): 12–14. Archived from the original (PDF) on 28 May 2015. ^ Ziauddin Sardar (1 August 2000). The Consumption of Kuala Lumpur. Reaktion Books. p. 49. ISBN 978-1-86189-057-3. ^ Gullick 2000, p. 21. ^ Yip Yoke Teng; Muhamad Shahril Rosli (13 June 2014). "Life is colourful on infamous road". The Star. Retrieved 13 June 2014. ^ "Malaysian Road Names: Who's Who?". Malaysian Digest. 18 June 2013. Archived from the original on 30 June 2017. Retrieved 13 June 2014. ^ "Sejarah Malaysia". Sejarah Malaysia. Archived from the original on 2 September 2002. Retrieved 15 December 2007. ^ a b "Old-World Charm". Virtual Malaysia Magazine. Archived from the original on 1 January 2008. Retrieved 18 December 2007. ^ a b c "Kuala Lumpur". Encyclopædia Britannica. Retrieved 6 December 2007. ^ "Yap Ah Loy's Administration". Yapahloy.tripod.com. 12 September 2000. Retrieved 5 October 2011. ^ Richard Baxstrom (14 July 2008). Houses in Motion: The Experience of Place and the Problem of Belief in Urban Malaysia. Stanford University Press. pp. 225–. ISBN 978-0-8047-7586-1. ^ Seng Fatt Lam (1 January 2000). Insider's Kuala Lumpur. Times Books International. ISBN 978-981-204-876-9. ^ Chiang Siew Lee (13 May 1990). "Kuala Lumpur: From a Sanitary Board to City Hall". New Straits Times. ^ "The Federated Malay States (1896)". Nation History. National Library of Malaysia. Archived from the original on 8 January 2004. Retrieved 6 December 2007. ^ a b Reassessment of Urban Planning and Development Regulations in Asian Cities. UN-HABITAT. 1999. p. 35. ISBN 92-1-131419-4. ^ Rough Guides Snapshot Malaysia: Kuala Lumpur. Rough Guides. 3 August 2015. ISBN 978-0-241-24195-0. ^ "On This Day". The Australian Army. Archived from the original on 18 December 2007. Retrieved 17 December 2007. ^ Keat Gin Ooi (2004). Southeast Asia: A Historical Encyclopedia, from Angkor Wat to East Timor, Volume 1. ABC-CLIO. pp. 138–139. ISBN 978-1-57607-770-2. ^ "1957: Malaya celebrates independence". BBC News. 31 August 1957. Retrieved 6 December 2007. ^ Lam Seng Fatt (15 October 2011). Insider's Kuala Lumpur: Is No Ordinary Travel Guide. Open Your Eyes to the Soul of the City (3rd ed.). Marshall Cavendish International Asia Pte Ltd. p. 77. ISBN 978-981-4435-39-0. ^ Felix Abisheganaden (2 November 1963). "The big step forward". The Straits Times. National Library Board. ^ a b "New book on 1969 race riots in Malaysia may be banned, officials warn". Associated Press. International Herald Tribune. 16 May 2007. Archived from the original on 11 October 2007. Retrieved 23 February 2013. ^ a b Yeoh Seng Guan, ed. (2014). The Other Kuala Lumpur: Living in the Shadows of a Globalising Southeast Asian City. Routledge. pp. 16–17. ISBN 978-0-415-73086-0. ^ "Destinations: Kuala Lumpur". Tourism Malaysia. Archived from the original on 2 January 2008. Retrieved 16 December 2007. ^ "Kuala Lumpur". Columbia Encyclopedia, Sixth Edition 2007. Columbia University Press. Retrieved 6 December 2007. ^ "Sejarah Shah Alam" (in Malay). Shah Alam City Council. Archived from the original on 6 March 2006. Retrieved 14 December 2007. ^ Geetha Krishnan. "PJC turns focus on maintenance issues". The Malaysian Bar. Retrieved 14 December 2007. ^ "Attractions". Ministry of Science Technology and Innovation. Archived from the original on 30 October 2007. Retrieved 11 December 2007. ^ "National Palace". National Library of Malaysia. Archived from the original on 4 December 2007. Retrieved 11 December 2007. ^ Yat Ming Loo. Architecture and Urban Form in Kuala Lumpur. Routledge. p. 88. ISBN 9781409445975. ^ Cox, Wendell (12 January 2013). "The Evolving Urban Form: Kuala Lumpur". New Geography. ^ Chun-chieh, Huang. Taiwan in Transformation: Retrospect and Prosepct. p. 378. ISBN 9789863500155. ^ Bunnell, Tim. "Chapter 4: Kuala Lumpur City Centre (KLCC): Global reorientation". Malaysia, Modernity and the Multimedia Super Corridor. ISBN 9780415256346. ^ "Kuala Lumpur: Growing Pains". Asia's Best Cities 2000. Asiaweek. Retrieved 4 December 2007. ^ Chan Ngai Weng (1996). "Risk, Exposure and Vulnerability to Flood Hazards in a Rapidly Developing Country: The Case of Peninsular Malaysia". National University of Malaysia. pp. 107–137. Archived from the original on 29 April 2015. Retrieved 29 April 2015. ^ "Kuala Lumpur Location". Malaysia Travel. Retrieved 18 September 2010. ^ "Extreme Temperatures Around the World". Maximiliano Herrera. Retrieved 18 September 2010. ^ "Weather in KL". Welcome-KL. Archived from the original on 9 February 2013. Retrieved 10 July 2012. ^ "Kuala Lumpur Environment". Kuala Lumpur City Hall. Retrieved 12 December 2007. ^ "Hazardous haze shrouds Kuala Lumpur". MSNBC. 11 August 2005. Retrieved 13 December 2007. ^ "Climate of Kuala lumpur" (in Russian). Weather and Climate (Погода и климат). Retrieved 8 October 2013. ^ "Kuala Lumpur Climate Normals 1961–1990". National Oceanic and Atmospheric Administration. Retrieved 24 April 2015. ^ "Kuala Lumpur, Malaysia – Climate data". Weather Atlas. Retrieved 29 March 2017. ^ a b "DBKL History". Kuala Lumpur City Hall. Archived from the original on 29 April 2015. Retrieved 29 April 2015. ^ "About KL City Hall – History". Kuala Lumpur City Hall. Archived from the original on 31 August 2010. Retrieved 18 September 2010. ^ "Malaysia's towns and cities are governed by appointed mayors". City Mayors. 2006. Retrieved 9 October 2006. ^ "Organisation Chart". Kuala Lumpur City Hall. Retrieved 6 April 2018. ^ Ng, Angie (13 August 2007). "New growth corridors added". The Star. Archived from the original on 15 June 2007. Retrieved 14 December 2007. ^ "Foreign Embassies and Consulates Directory in Malaysia". GoAbroad.com. Archived from the original on 9 May 2010. Retrieved 14 January 2015. ^ "The World According to GaWC 2008". Globalization and World Cities Study Group and Network (GaWC). Loughborough University. Retrieved 16 May 2009. ^ "Gross Domestic Product (GDP) by State, 2008". Department of Statistics Malaysia. Archived from the original on 13 November 2010. Retrieved 15 September 2010. ^ "GDP by State and Kind of Economic Activity, 2008" (PDF). Department of Statistics Malaysia. Archived from the original (PDF) on 13 November 2010. Retrieved 15 September 2010. ^ "GDP by State" (PDF). Department of Statistics, Malaysia. Retrieved 13 June 2015. ^ "Median monthly household income for Malaysians has increased to RM5,228". Human Resources. ^ a b c d e f g "Kuala Lumpur Economic Base". Kuala Lumpur City Hall. Retrieved 10 December 2007. ^ Sy, Amadou (18 September 2007). "Malaysia: An Islamic Capital Market Hub". Survey Magazine. International Monetary Fund. Retrieved 12 December 2007. ^ "World Largest Islamic Bank opens branch in Malaysia". ClickPress. 13 February 2006. Retrieved 12 December 2007. ^ Tam, Susan (10 April 2007). "Malaysia needs to look beyond being hub for Islamic finance". The Star. Archived from the original on 20 February 2009. Retrieved 12 December 2007. ^ "The Global 2000 (Malaysia)". Forbes. Retrieved 15 September 2010. ^ "Main page". Institute for Medical Research, Malaysia. Retrieved 12 December 2007. ^ Top 10 most visited cities in the world. Enjoyourholiday.com. Retrieved on 27 September 2013. ^ Bremner, Caroline (10 January 2010). "Trend Watch: Euromonitor International's Top City Destination Ranking". Euromonitor International. Archived from the original on 31 August 2010. Retrieved 27 August 2010. ^ "KL's grand makeover". TTGmice. Archived from the original on 5 June 2013. Retrieved 20 December 2012. ^ "Kuala Lumpur Travel". Archived from the original on 27 August 2009. Retrieved 15 September 2009. ^ "Sri Mahamariamman Temple". Welcome-KL. Archived from the original on 9 February 2013. Retrieved 10 July 2012. ^ "Did You Know?". Official Portal Visit Kuala Lumpur. ^ Shanti Gunaratnam. "Wooing Indonesian shoppers". New Straits Times, Travel News. Archived from the original on 18 December 2007. Retrieved 18 December 2007. ^ a b "Google Cache Of 'Historical Buildings in Malaysia'". webcache.googleusercontent.com. Archived from the original on 9 December 2012. Retrieved 18 September 2010. ^ "Malaysia's shopping landscape with main and new shopping precincts". Tourism Malaysia. Archived from the original on 5 April 2018. Retrieved 6 April 2018. ^ "Population by States and Ethnic Group". Department of Information, Ministry of Communications and Multimedia, Malaysia. 2015. Archived from the original on 12 February 2016. Retrieved 12 February 2015. ^ Aziz, Su. "Far from the madding crowd". The New Straits Times Online. Archived from the original on 18 December 2007. Retrieved 4 December 2007. ... one of the many 30-something KLites seeking..
^ a b "Kuala Lumpur Culture & Heritage". AsiaWebDirect. Retrieved 4 December 2007. ^ a b c d "2010 Population and Housing Census of Malaysia" (PDF) (in Malay and English). Department of Statistics, Malaysia. Archived from the original (PDF) on 5 February 2013. Retrieved 17 June 2012. ^ a b Prem Kumar Rajaram. Ruling the Margins: Colonial Power and Administrative Rule in the Past and Present. pp. 34–35. ^ Gullick 2000, p. 43. ^ King, Ross (2008). Kuala Lumpur and Putrajaya: Negotiating Urban Space in Malaysia. University of Hawaii Press. pp. 90–91. ISBN 978-0-8248-3318-3. ^ "Forced out to suburbs". The Star. 7 May 2015. Archived from the original on 5 February 2016. Retrieved 17 May 2015. ^ "Malaysia to reduce number of foreign workers to 1.5 mln". People's Daily Online. 2 September 2006. Retrieved 15 December 2007. ^ Mydans, Seth (10 December 2007). "A Growing Source of Fear for Migrants in Malaysia". International Herald Tribune. Retrieved 15 December 2007. ^ "Religion by Location: Malaysia". Adherents.com. Retrieved 15 December 2007. ^ "2010 Population and Housing Census of Malaysia" (PDF) (in Malay and English). Department of Statistics, Malaysia. p. 96. Archived from the original (PDF) on 16 January 2013. Retrieved 17 June 2012. ^ Lam Seng Fatt (15 March 2011). Insider's Kuala Lumpur (3rd Edn): Is No Ordinary Travel Guide. Open Your Eyes to the Soul of the City (Not Just the Twin Towers ...). Marshall Cavendish International Asia Pte Ltd. pp. 9–. ISBN 978-981-4435-39-0. ^ "Kuala Lumpur Culture & Heritage: Traditions, Races, People". Kuala Lumpur Hotels & Travel Guide. Retrieved 16 February 2008. ^ Ziauddin Sardar (2000). The Consumption of Kuala Lumpur. Reaktion Books. pp. 120–. ISBN 978-1-86189-057-3. ^ Diamonstein, Barbaralee; Jersey, New (23 September 1990). "Landmarks of Kuala Lumpur". New York Times, Travel. Retrieved 18 December 2007. ^ Malaysia, Modernity and the Multimedia Super Corridor: A Critical Geography, page 74. Google Books. 12 March 2004. ISBN 978-0-203-64736-3. Retrieved 14 December 2007. ^ "Petronas Towers". Pearson PLC. Infoplease. Retrieved 11 December 2007. ^ Henry, Brandi. "Petronas Towers". illumin. USC Viterbi, School of Engineering. Archived from the original on 26 November 2007. Retrieved 10 December 2007. ^ "The Worlds Tallest 50 Urban Agglomerations". CTBUH Journal. Council on Tall Buildings and Urban Habitat. Retrieved 14 January 2012. ^ "Top five ways to enjoy Kuala Lumpur". Melbourne: The Age. 20 February 2005. Retrieved 14 December 2007. ^ "Oldest Primary Forest within a City". TargetWoman Directory. Retrieved 4 December 2007. ^ "Education and Social Characteristics of the Population, Population and Housing Census 2000" (Press release). Department of Statistics, Malaysia. August 2002. Archived from the original on 11 December 2007. Retrieved 10 December 2007. ^ "Get experienced and qualified home tutors in KL,". who can deliver inspiring lessons and see improvement within one month. Home Tutor Malaysia. Retrieved 5 January 2014. ^ "Existing situation of Educational facilities". Kuala Lumpur Structure Plan 2020. Kuala Lumpur City Hall. Retrieved 12 December 2007. ^ "Carnegie Mellon University's Heinz School to Offer Professional Master's Degree at University of Malaya in Kuala Lumpur in New Collaboration" (Press release). Carnegie Mellon University. Archived from the original on 13 December 2007. Retrieved 13 December 2007. ^ "QS World University Rankings 2019". Retrieved 20 July 2018. ^ "UM out to woo foreign students". The Star. 2 July 2007. Archived from the original on 4 July 2007. Retrieved 18 December 2007. ^ "Background". National Defence University of Malaysia. 19 March 2013. Archived from the original on 4 April 2015. Retrieved 30 April 2015. ^ "Main Page". Muzium Negara Malaysia. Archived from the original on 1 January 2008. Retrieved 11 December 2007. ^ "Main". Islamic Arts Museum Malaysia. Archived from the original on 18 December 2007. Retrieved 11 December 2007. ^ "Craft Cultural Complex Kuala Lumpur – Kompleks Budaya Kraf". Archived from the original on 24 February 2011. Retrieved 19 November 2010. ^ "Meet the MPO". Malaysian Philharmonic Orchestra. Archived from the original on 28 August 2007. Retrieved 11 December 2007. ^ "Main page". Kuala Lumpur Performing Arts Centre. Archived from the original on 25 December 2007. Retrieved 18 December 2007. ^ "Future Music Festival Asia". Livescape. Retrieved 8 April 2018. ^ "Main". Malaysia International Gourmet Festival. Archived from the original on 12 October 2007. Retrieved 13 December 2007. ^ "Kuala Lumpur Fashion Week 2005". People's Daily Online. Retrieved 13 December 2007. ^ "Community Facilities". Kuala Lumpur Structure Plan 2020. Kuala Lumpur City Hall. Retrieved 12 December 2007. ^ "Circuit Guide: Sepang, Malaysia". BBC Sport. 17 February 2006. Retrieved 13 December 2007. ^ "Season 2007/08". A1GP. Archived from the original on 21 December 2007. Retrieved 13 December 2007. ^ "2004 MotoGP Sepang Results". MotorcycleUSA. 10 October 2004. Retrieved 3 May 2012. ^ "Roar of the Dragons: Westports Malaysia Wins First Ever ABL Crown". ASEAN Basketball League. Retrieved 13 April 2016. ^ "Main page". Kuala Lumpur Grand Prix 2007. Archived from the original on 1 May 2008. Retrieved 12 December 2007. ^ "KL Tower International BASE Jump 2007". Retrieved 12 December 2007. ^ "Tour de Langkawi". Ministry of Youth and Sports, Malaysia. Retrieved 12 December 2007. ^ Lam Seng Fatt (15 October 2011). Insider's Kuala Lumpur (3rd ed.). Marshall Cavendish International Asia Pte Ltd. p. 65. ISBN 978-981-4435-39-0. ^ Duncan Mackay (13 March 2012). "Kuala Lumpur set to be city where 2022 Winter Olympics decided". Inside the Games. Retrieved 30 April 2015. ^ Nick Butler (6 December 2014). "Lausanne and Brașov shortlisted to host 2020 Winter Youth Olympic Games". Inside the Games. Retrieved 30 April 2015. ^ Bryan Collinsworth (29 January 2007). "Apocalypse Now". Campus Progress. Archived from the original on 21 June 2007. Retrieved 11 December 2007. ^ "Bart Gets Famous Trivia and Quotes". TV.com. Archived from the original on 2 April 2009. Retrieved 12 August 2010. ^ Gunaratnam, Shanti (20 March 2007). "KL pictorial handbook". New Straits Times online. Archived from the original on 18 December 2007. Retrieved 14 December 2007. ^ "Democracy (Plot Summary)". Answers.com. Retrieved 14 December 2007. ^ "The Amazing Race Episode Recaps". CBS. Archived from the original on 27 November 2007. Retrieved 11 December 2007. ^ a b Azlan (13 October 2006). "Headline: Percentage usage of public transport to be increased to 40 percent". Radio Televisyen Malaysia. Archived from the original on 30 September 2007. Retrieved 22 October 2006. ^ "KL20 Transportation". Kuala Lumpur City Hall. Retrieved 6 April 2018. ^ "Malaysia Airlines Takes Flight to MEGACITIES on National Geographic Channel" (Press release). National Geographic. Archived from the original on 6 February 2008. Retrieved 19 December 2007. ^ "KLIA Ekspres". Express Rail Link Sdn Bhd. Archived from the original on 8 December 2007. Retrieved 13 December 2007. ^ "Subang only for turbo-props". Asian News Desk. 27 November 2007. Archived from the original on 18 December 2007. Retrieved 13 December 2007. ^ "KL, suburbs get 25 new LRT stations". The Star/Asia News Network. The Straits Times. 2 July 2016. Retrieved 3 July 2016. ^ "Intercity services". Keretapi Tanah Melayu Berhad. Archived from the original on 14 December 2007. Retrieved 19 December 2007. ^ Razak Ahmad; Hemananthani Sivanandam (17 July 2017). "Najib launches Phase 2 of Sungai Buloh-Kajang MRT line". The Star. Retrieved 17 July 2017. ^ Tan Sri Nor Mohamed Yakcop (Minister of Finance II) (10 September 2007). Launching of the Cyberjaya Dedicated Transportation System (Speech). Cyberjaya. Retrieved 14 December 2007. ^ "Rapid KL to revamp network". Cleanairnet.org. 14 November 2008. Archived from the original on 6 March 2008. Retrieved 18 September 2010. ^ Adrian Phung (6 June 2014). "Newly improved bus hub to transform urban transport system". The Sun. Retrieved 6 April 2018. ^ Sheila Sri Priya (6 April 2015). "Planned BRT system will help ease traffic congestion on Federal Highway". The Star. Retrieved 6 April 2018. ^ Arfa Yunus (3 July 2015). "KL taxi drivers top list of worst drivers in 10 cities". The Rakyat Post. Retrieved 8 April 2018. ^ "Here's What Local Users And Foreign Tourists Think of KL Taxi Drivers". Malaysian Digest. 4 August 2015. Archived from the original on 7 April 2018. Retrieved 8 April 2018. ^ "Port Klang retains top ranking among Malaysia's ports". SchedNet. 24 May 2007. Archived from the original on 26 June 2007. Retrieved 19 December 2007. ^ "Chennai, Kuala Lumpur sign sister city pact". The Hindu. Chennai, India. 26 November 2010. Archived from the original on 29 November 2010. Retrieved 26 November 2010. ^ "Sisterhoods". Isfahan Islamic Council. 2005. Archived from the original on 12 October 2007. Retrieved 4 December 2007. ^ "Mashhad-Kuala Lumpur Become Sister Cities". Mircea Birca. Eurasia Press and News. 14 October 2006. ^ "Sister Cities of Shiraz". Shiraz Municipality. 12 June 2010. Archived from the original on 27 September 2011. Retrieved 30 April 2015. ^ "ビジネスパートナー都市(BPC)" (in Japanese). Osaka Policy Planning Office. 19 September 2012. Archived from the original on 20 January 2013. Retrieved 1 December 2015. ^ "Bandar Kembar Melaka, Hoorne" (PDF). Bernama (in Malay). National Library of Malaysia. 7 July 1989. Archived from the original (PDF) on 25 September 2015. Retrieved 25 September 2015. ^ "Eight Pakistani cities have 47 sister cities around the world". Associated Press of Pakistan. 16 May 2011. Archived from the original on 20 December 2015. Retrieved 1 December 2015. ^ "Relations between Turkey and Malaysia". Ministry of Foreign Affairs (Turkey). Archived from the original on 30 June 2015. Retrieved 1 July 2015. 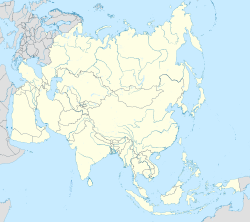 ^ "KL's Sister Cities – Poskod Malaysia". Poskod Malaysia. 21 October 2010. Archived from the original on 30 August 2013. Retrieved 13 February 2017. Gullick, J.M. (1955). "Kuala Lumpur 1880–1895" (PDF). Journal of the Malayan Branch of the Royal Asiatic Society. 24 (4): 10–11. Archived from the original (PDF) on 28 May 2015. Gullick, J.M. (2000). A History of Kuala Lumpur 1856–1939. The Malaysian Branch of the Royal Asiatic Society. Wikimedia Commons has media related to Kuala Lumpur. Wikivoyage has a travel guide for Kuala Lumpur.